The China Marines —Part III – Fix Bayonets! Shanghai remained peaceful for the next few years —the 4th Regiment assuming regular guard and garrison duty. During this time, the regiment participated in the Fessenden Fifes (a fife and drum corps created by Sterling Fessenden, honorifically regarded as the Lord Mayor of Shanghai) and established close ties with the 1st Battalion, Green Howards —a famous British Regiment whose long service was finally ended with the amalgamation of British army units in 2006. The 4th Regiment thus became the only organization in the Marine Corps to have a Fife and Drum Corps. Marines were taught to play donated instruments by members of the Green Howards. The 3rd Brigade was withdrawn in 1928. In 1930, the 4th Regiment of Marines was redesignated as the 4th Marines and numbered companies were changed to alphabetic designations: Company A, Company B, and so on. In January 1932, the international settlement was again threatened —this time by Japanese forces stationed in Manchuria. After their defeat in battle by the Japanese, Chinese forces resorted to other means to oppose Japan’s actions in Manchuria, including the boycott of all Japanese-made goods. 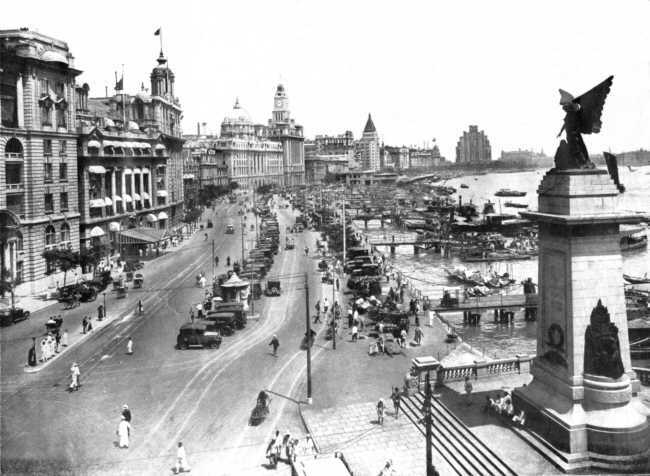 The effects of this boycott were most noticeable in Shanghai, which became the center of anti-Japanese feeling. Bloody clashes erupted between Chinese and Japanese civilians in 1932, and this led the Japanese military garrison in Shanghai mount attacks against Chinese nationalist forces in neighboring Chapei (today the Zhabei District of Shanghai). The 4th Marines again deployed to prevent violence spilling over into the international settlement and began making security patrols with civilian policemen. The 4th Marines were reinforced in February by Marines from the Philippines and by the Marine Detachment aboard the USS Houston. The 31st US Infantry was likewise ordered to China. Japanese and Chinese forces continued to clash for over a month. The conflict ended in early March when the Chinese withdrew from Chapei and with an agreement that each side would return to their former positions, the state of emergency was ended in early June. The 31st US Infantry returned to the Philippines, the 4th Marines resumed its normal routine, but the Commander of the Asiatic Fleet recommended that the Marine Corps bring the 4th Marines up to full strength. A new 2nd Battalion was activated in mid-September 1932 —marking the first time the 4th Marines had had three battalions since 1927. Sterling Fessenden (1875-1943) was a practicing attorney in Shanghai after 1903. He was taken prisoner by the Japanese in 1941 and died while interned with Russian captives in 1943). Old feelings die hard, sir, don’t they? Most Marines will tell you old feelings only die when they do. …but I do hope they can move on with such old feelings, sir. All who serve in the Marines are changed by the experience. Most ( I hope ) for,the better. Many Marines have a very strong attachment for the Corps and all the good things they have done. Mustang is among the few in deep historical knowledge of our Corps. We’re damn lucky to have him. He was a superior Marine while in his nearly three decades of active service and he continues to,serve in presenting FIX BAYONETS as well as writing very well researched and hard-hitting columns on issues that plague our country and the world today. Side Note. The Bitish Army has shrunk to a shadow of its’ former self. Many of,the great old regiments are gone. Why? Because Britain has embraced socialism. And we are doing the same. Recently the 9th Marine Regiment folded its’ Colors and is no more. Thank you for your kind comments, sir. Though we may not be interested in war, war will be interested in us. Let us not be weak as a nation and a people. Absolutely, LR … and thank you for visiting and following Fix Bayonets! The pleasure is mine, Mustang.